We left the parking lot just east of the tunnel with shoes (I wore Fireblades, Buzz and Exum Ridges) shorts, t-shirts, and water-bottle fanny packs. We cruised out to the over look point on the easy trail. Once at the overlook point, it immediately takes a change of terrain as you’re instantly on incredibly rad slabs. They’re the perfect angle. We called this some of the best “slab running” around! 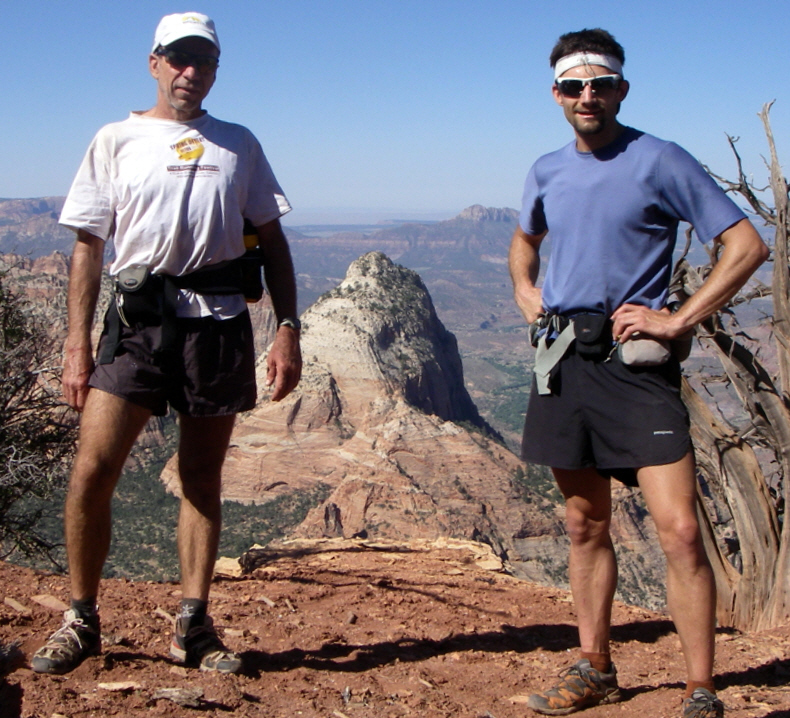 We traverse to the northwest gaining 1000-1500′ or so of elevation. Be sure to not head straight up to the base of the large red cliffs as we eventually had to drop down into a gully. Knowing this we trended in a northwest directly to a set of hoodos, dropped down into the gully losing maybe 300-500′ of vert, then climbed the face to the left of another gully (easy class 5), gaining maybe 500-700′ of vert to the skyline where there were some more hoodos. Instead of climbing a more difficult dihedral, we wrapped around by traversing horizontally (maybe 1 or 2 class 5 moves) and then climbing up a short gully of perhaps 200′ of vert. Then we were on the best rock of the entire peak. Maybe 400-500′ ft of excellent rock on the northwest ridge of the peak. Once we reached the top of this were were on an upper plateau with trees, brush and dirt, the only thing above you is the top band of red rock. 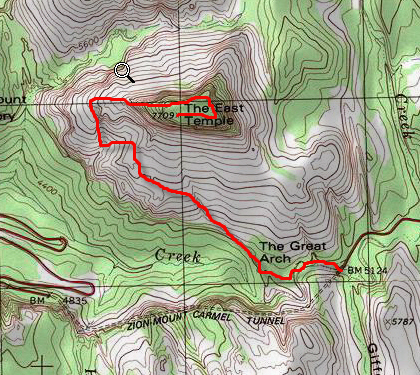 We traversed the north face of this red rock all the way to the east side of it, and then even wrapped around to the southeast to an easy class 2 trail to the summit plateau. We reached the high-point in 1 hr 36 minutes from the car. It was great. This entry was posted on June 29, 2008 at 12:39 pm and is filed under Trip Report. You can follow any responses to this entry through the RSS 2.0 feed. You can leave a response, or trackback from your own site. Sounds (and looks) like a sweet climb! I love it when you can complete a climb in half the amount of time you expected. Jared can really motor; the fastest scrambler I’ve ever seen. 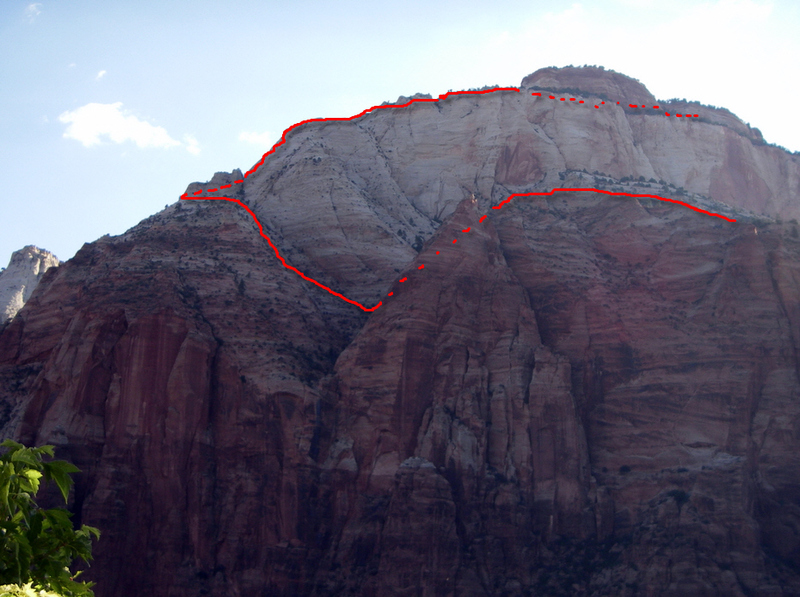 East Temple is a very obvious summit in Zion NP; it towers above the valley, the town, the highway tunnel … yet far fewer people climb it than most 8,000 meter peaks! Thus, a very worthy objective. It’s probably been summitted less than 20 times ever … this should now change. Our route last fall included two 5th class pitches, which were circumvented this time, thus enabling the no-gear, light and fast style. I’d like to name this the “Casual Route”, in honor of Charlie Fowler. Charlie did the 2nd ascent of the new “Integral Route” on the Diamond on Longs Peak, free-solo, and called it “casual” (which it very much isn’t) … and the name stuck for the now very popular and easiest (5.10) route on this face. Charlie died in China last year, so here is another “Casual Route” for everyone to enjoy; a route far easier than expected (if you’re really solid on very exposed 4th class slabs), up an outstanding summit. Tried this route over the weekend. How in the world did you reverse the bolt line near the top (on the NW “good rock”)? Got there with no rope and bailed, knowing that it would be to sketch to reverse those 2-3 pitches of glued in bolt pitches. If that is the way you guys went, crazy! Glad you had a go! East Temp towers over everything, it’s amazing, yet few people set foot on it … although as you noticed, there are reasons for that. I’ve not seen a single bolt up there, so that must be new, and that also means I’m not sure where you were, but am sure there is only one moderate way up … everything else is upper 5th class at least. The exposure is ludicrous and there are few handholds … have to be confident with the feet. We went back that fall to do the Temple Double (also on this blog), and took the time down to 1:44:40, which I feel very good about. Not sure if others have soloed it. But if not comfortable doing that, bring a rope and a friend; it’s one of the best summit routes anywhere in the world. Us posers trying to be like you guys.